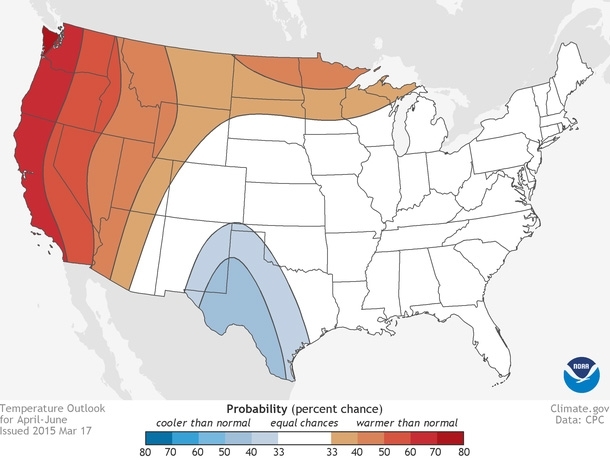 NOAA’s Climate Center has issued its 2015 Spring Outlook covering flood potential, precipitation, temperature and drought through the April-June period. The flood outlook is for mid-March to Mid-May. 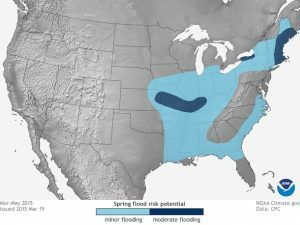 According to the outlook, the greatest potential for Spring flooding is in the Northeast along with a portion of the lower Missouri River and other nearby rivers and streams in parts of southern Illinois, southwest Indiana and far northern Kentucky. The near term potential is being driven by snow melt. That melt will also influence the somewhat longer term in that soil moisture will be above average to far above average in those areas. As for temperatures, much of the eastern two-thirds of the nation will experience near-normal temperatures with the West Coast being much above normal. Only portions of Texas and New Mexico are forecast to be below normal. The outlook calls for above-normal precipitation in the Southeast and the Four-corners area with below normal precipitation in the Pacific Northwest and parts of Minnesota and Wisconsin. The rest of the country will be near normal. 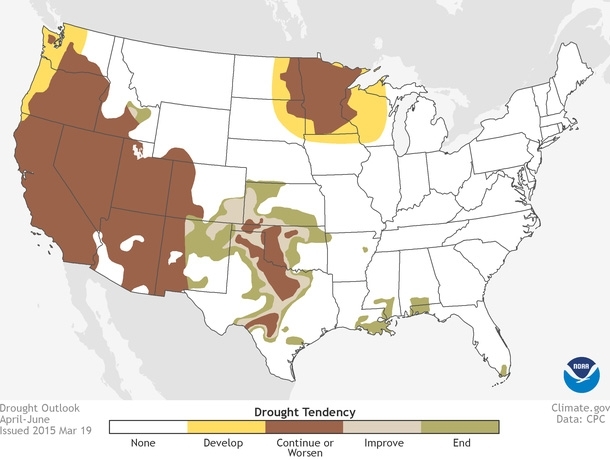 Drought conditions will continue or worsen in much of the western third of the country and drought may also spread from Minnesota into Wisconsin. The drought will improve in eastern New Mexico and Oklahoma. 40% of California is already in an exceptional drought and the predicted hot temperatures and lack of precipitation will exacerbate that situation. The precipitation and drought outlooks bode ill for the upcoming fire season. As always, the long term outlook comes with a caveat that specific weather systems can always cause additional flooding and other impacts so readers should always stay alert.